This is a quick and easy dairy free and nut free recipe and it will be done in under half an hour! With a neutral flavor, this homemade plant based cream cheese can be turned into a sweet or savory flavor of your choice. It is a great vegan cream cheese spread that can be used on crackers, sandwiches, frosting and more! 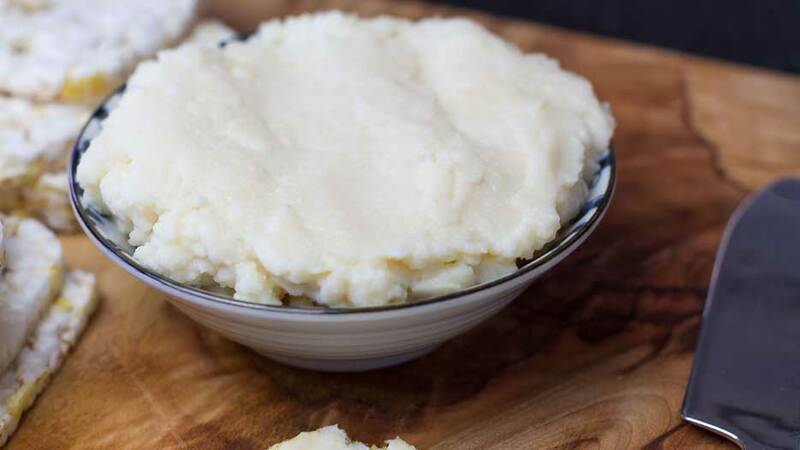 For this simple recipe you will need a medium saucepan or pot, a stirring spoon, whisk and a glass or plastic bowl to put in the fridge while the cheese sets. Add your agar agar to the pan first, followed by the hot water and milk, then bring the mixture to a boil, then simmer for 7 - 10 minutes until the mixture thickens. Pour the hot mixture into your storage bowl and place in the fridge for approximately 20 minutes until set. Once the mixture has set, take it out of the fridge and use your whisk to break it up until the texture starts to feel like cream cheese. Next add the lemon juice, salt and sugar, then mix through thoroughly. From here you can take this base recipe and you can make it sweet or savoury. E.g. Cinnamon, sugar, maple syrup for a sweet option or go down the savory road with herbs, garlic, chives, pepper etc. The options are up to you. Thanks for your videos, you’re so sweet and friendly plus you explain very good your recipes. I think you should write a cookbook, I’d buy it straight away. Hi Anja! Thanks you so much for your beautiful heart and generosity! I recently used a savory cheesecake recipe,loved it but probably won’t make it very often due to the store bought “fake” cream cheese. Have you tried baking with the cream cheese from this recipe? PS I Love Forks Over Knives and The China Study!! i just found your recipe for the cream cheese, and while watching your video, I was wondering how to use it for frosting? How much sugar and anything else would it need? Can I use it for baking? It looks wonderful and easy to make, thank you! How do you think this would hold up frozen? It should be ok but I haven’t tried freezing it. Hi Anja – do you think you could use coconut milk for this? You can but it will add sweetness to the overall flavor. This should work in a no-bake cheesecake right? Hi Anja, Thank you so much for your wonderful videos. ps. You have beautiful eyes! So glad that you have found my recipes Dawn, and I’m so glad that you on your healing journey. Can i use something else than Agar Agar in the cheese recipes Anja. I’ve only used agar powder.